Product prices and availability are accurate as of 2019-04-17 19:27:44 EDT and are subject to change. Any price and availability information displayed on http://www.amazon.com/ at the time of purchase will apply to the purchase of this product. Perfect the art of portable cooking with the compact VonShef 1800W Induction Hob. Versatile, efficient and easy to use, the Induction Hob is just the job when you're cooking for large parties and need extra cooking space. It's also ideal for caravans, camper vans, student accommodation, bedsits, rented accommodation and any kitchen where space is at a premium. How does induction cooking work? The induction process works by allowing heat to pass straight through the hob so that the pan gets hot rather than just the hob surface. This makes it safer, faster and more energy efficient compared to traditional electric hobs. Another advantage of the hob is its ability to heat food evenly, so there's less chance of it burning at the bottom of the pan. The hob features a clear 4 digit LED display screen and touch controls which makes it incredibly simple to use. 10 heat settings - adjustable between 140 - 464°F - give you complete control, with the added bonus of being just as responsive as gas. 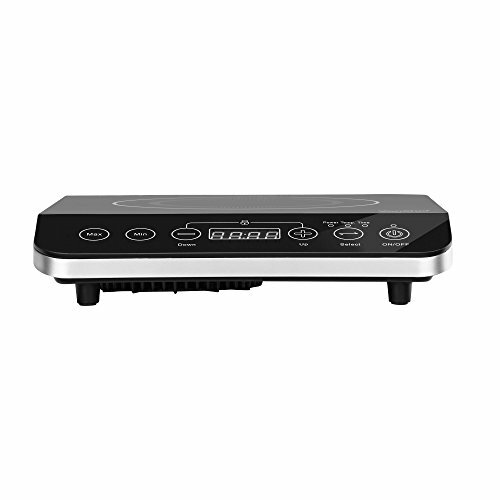 10 power levels - programmable between 200W - 1800W further make cooking to perfection a breeze. You can keep track of cooking via the built-in timer, which can be set to cook for up to 3 hours. Built to last, the hob features a toughened black glass top and scratch proof ceramic plate. Easy clean - simply wipe down with a damp cloth. 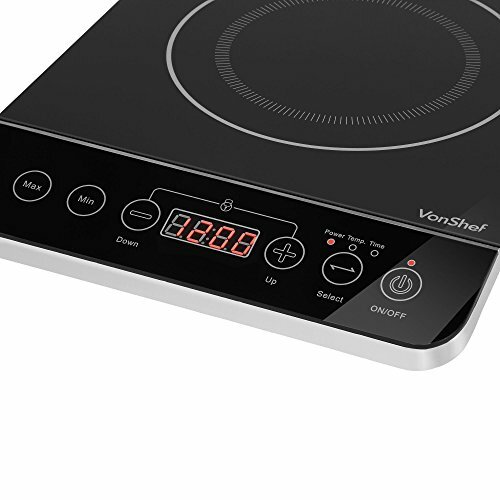 Please note: the induction hob is suitable for use with induction pans with a base diameter of up to 10.2 inches ONLY. 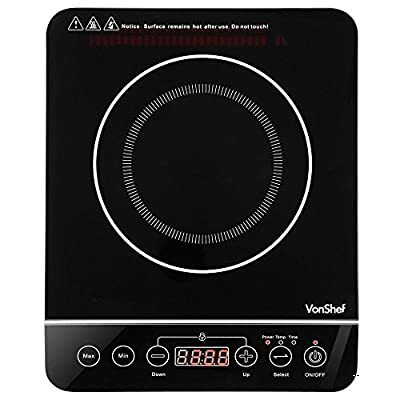 Size: 11.4 x 14.1 x 2.5"
Portable and powerful 1800W induction hob - great for small & cramped kitchens, caravans, camper vans, student accommodation, bedsits, rented accommodation and when cooking for large parties or Christmas Safer, faster and more energy-efficient compared to traditional electric hobs Easy-to-use with clear 4 digit LED screen display, touch controls, 10 heat settings (140 - 464°F), 10 power settings (200W - 1800W) and 3 hour programmable timer Strong construction with toughened black glass top and scratch proof ceramic plate Suitable for use with induction pans only. Size: 11.4 x 14.1 x 2.5"